In Part I of this series we examined the exceptional importance of development issues to the City Council races and the kind of coverage those issues are getting and we reviewed in detail an April 20th forum for candidates running for the 33rd Council District. 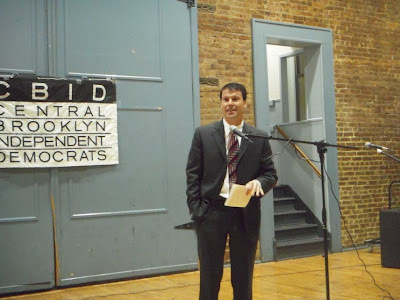 On April 23, 2009, only a few days later, candidates for both the 33rd and 39th City Council districts were invited to speak at an evening set up by the Central Brooklyn Independent Democrats. We will not review this evening in as great a depth. We hope we have already given you a feel for the issues and how our own reporting might be different from what you are picking up from the local papers. You can, however, provide you with this audio recording of the evening. 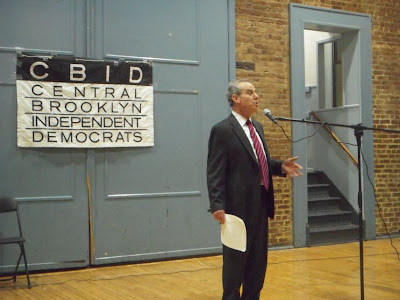 Central Brooklyn Independent Democrats provided a quite valuable resource for looking at the candidates’ positions in that they have questionnaires completed by most the candidates on line. (Available at the main site for endorsees and in the archive for others.) For faster reference and easier access, we are providing the candidates’ answers on development and Atlantic Yards here. 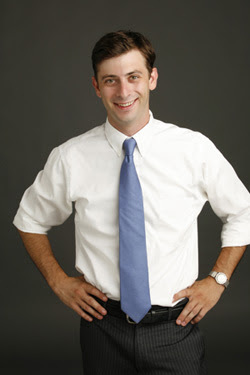 In addition, Stephen Levin, a candidate for the 33rd to replace David Yassky did not show up on the 20th or the 23rd and did not return a completed questionnaire form to the CBID: We have obtained from him an answer to the question on the form respecting development and Atlantic Yards which we will set forth below. We are also supplying, from similar CBID questionnaires, the answers to the same questions from the City Councilmen being replaced, David Yassky and Bill de Blasio. Here is another formulation we warn you about: Don’t trust the politician who says that `Atlantic Yards is already dead.’ That only amounts to an excuse to do nothing about it. Right now Atlantic Yards may look as awful as Dracula’s desicated corpse dissolving in the sunlight but it will not be really and truly dead until our politicians step up to the plate and affirmatively kill it. Marisa Lago, the head of the Empire State Development Corporation, has said that her state agency intends to keep pursuing the project no matter that the process of suffering its completion will take decades. And another 30 to 40 or more years that could mean CBID questionnaires that several additional generations of politicians will be filling out on the subject. important development issues facing the residents of your district? 1. Should all the streets and avenue be closed? 2. Should the site be one developer or multiple sites with multiple developers like Battery Park City or Queens West? 3. Should the site be developed at such extraordinarily high density? 4. Should so much in the way of subsidies be concentrated on this single site rather than being used for multiple sites that are more spread out? 5. Should eminent domain be used to condemn land for the arena? 6. Should eminent domain be used to condemn land for the non-arena land such as the Ward Bakery Building block? 7. Should the developer have been allowed to destroy the historic Ward Bakery Building? 9. Was the Emprire State Development Corporation justified in its “blight” findings? 10. Should the developer be getting windfalls by not having to bid for or pay for: a.) the value of the upzonings, and b.) the full value of the 40% of the land (the Vanderbilt Yards) it is acquiring from the MTA? 11. Is taxpayer financing of sports venues justified when the team owner gets all the profit and absolute control over the site? 12. How should the subsidies recaptured from Atlantic Yards be redeployed to other uses, presuming they are recaptured? Here then are responses of the candidates. As appropriate we have added some commentary. Was against Atlantic Yards from the very first minute, because of many reasons. Eminent Domain was misused and should not be used by individuals for personal gain. People have struggled for years in “mom-pop” business so that Ratner could destroy the means of livelihood. I’m still opposed to the project, this is not Russia. Affordable Housing, better transportation less congestion and better Health and Child care. 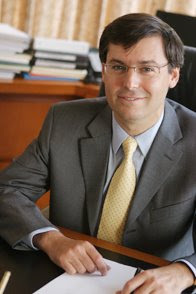 b. I have worked to prevent the inclusion of high-rise luxury condos within the Brooklyn Bridge Park and support Senator Squadron’s plan to finance and develop the park. I support the listing of the Gowanus Canal area as a super fund site, and I oppose the rezoning of a 25 block part of the area to mixed use and residential, which would lead to the warehousing and demolition of buildings. This is what has happened along the waterfront in Williamsburg, and it is a travesty that many commercial endeavors went out of business. I will fight against any proposal that might lead to the displacement of businesses, residents, or artists. I favor downzoning along the waterfront in Williamsburg and Greenpoint as well as on 4th Avenue. I have been outspoken in my support for designating Carroll Gardens as an historic district and have testified and spoken at meetings in opposition to the Toll Bros. project, the height of Oliver House, and in favor of the zoning text amendments for the wide streets that thankfully now limit the height of buildings on the Place streets. I support, “Develop Don’t Destroy Brooklyn,” “Stop Brooklyn House of Detention,” historic districts and preserving the charm of Brooklyn Neighborhoods. In 2005, I felt Atlantic Yards was too large in scale, would overload the infrastructure and the massive government subsidies/giveaways and use of eminent domain were wrong. Today, I support pressing the reset button on Atlantic Yards and adhering more to what the community wants. In general, Brooklyn rezoning is out-of-scale and out-of-touch. Care must be taken in DUMBO rezoning underway and Greenpoint rezoning revisited altogether. In my conversations with residents of DUMBO and Greenpoint, and from attending CB2 hearings, it appears that many voices in the community, including DUMBO Neighborhood Association, are simply ignored by the DCP, even voices that are fine with rezoning, just not at the scale adhered to by DCP. As for the Brooklyn Bridge Park, I support Daniel Squadron’s PIRCs plan to rid the park of private condos and, instead, replace them with a year round YMCA facility. Also, I support less berm and more ball fields. In particular, leaving Pier 5 dedicated to the planned sport fields and adding two new baseball diamonds along Furman replacing just a small portion of the berm. The baseball diamonds would be one little league or softball infield and the other being a full size baseball infield. Our children, schools and adults need this active recreation capacity. Ultimately, I support more parks, ball fields, and waterfront promenades, especially in Greenpoint, Williamsburg and Boerum Hill. I unequivocally support the Brooklyn Greenway Initiative and building safe capacity for cyclists. Development must be integrated to serve the needs of all of our communities and transportation modes. I was against the Atlantic Yards development from the beginning. I was the first at the Community Board to report secret meetings, publicly spoke out and was almost removed from the Community Board for opposing the Borough President’s position. I fought back by holding a press conference which embarrassed the BP sufficiently so that he reappointed me immediately. Regarding Eminent Domain, the Kelo decision requires a public process first – not a prior designation of a developer. Therefore eminent domain usage is totally inappropriate. Regarding Brooklyn Bridge Park, I support year round recreation for Brooklyn Bridge Park and opposed housing. I opposed the Dock Street project because it compromises the view of one of Brooklyn’s most treasured icons, the Brooklyn Bridge. I also opposed the tactics used by Two Trees to try to both bribe and threaten the Brooklyn Heights and DUMBO communities. I find it highly offensive that greedy developers get to play by a different set of rules than the rest of us. 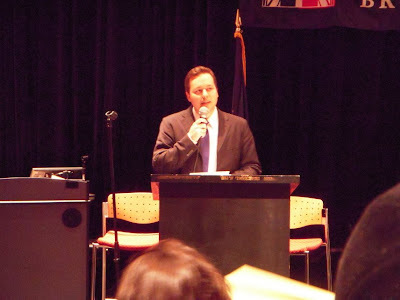 I also opposed the Toll Brothers project and the Gowanus rezoning and have worked with members of FROGGS in opposition. I oppose those projects at this time because NYC should temporarily suspend City Planning’s ability to convert M1 – M3 zones into residential or mixed use zones until an independent study of NYC’s long term land use needs for green tech, future high tech and medium tech industry is undertaken. The following is a response to the questionnaire’s question which we independently obtained from Stephen Levin who did not attend the public candidate events and who did not fill out the entire CBID questionnaire. Originally we were not sure we would be getting a response. Mr. Levin is Assemblyman Vito Lopez’s chief of staff. Mr. Lopez is viewed as a behind-the-scenes supporter of Atlantic Yards. There was speculation that Mr. Levin might drop out of the race and one reason that could have been a possibility is that remaining in the race would pose difficulties Mr. Levin’s having to take a postion on Atlantic Yards could create awkwardness to the extent it did not comport with Mr. Lopez’s, or forced Mr. Lopez to define his position further. When were not able to get a prompt response from Mr. Levin about his position we contacted Mr. Lopez’s office for Mr. Lopez’s position on Atlantic Yards since the thinking was that Mr. Levin’s postion could be considered to track that of Mr. Lopez. We have not yet heard back from Mr. Lopez’s office. More about Mr. Lopez’s position following this statement from Mr. Levin’s of his own position. In 2005, I was working as a community organizer in Bushwick. Therefore, I was not entirely familiar and did not have an official position on the Atlantic Yards project at that time. Since that time, I have developed a position on the Atlantic Yards project. I have many serious concerns about the Ratner plan as it is currently proposed. I especially have concerns regarding the proposed density of the development and the resulting strain that this density will put on the area's infrastructure, e.g. traffic, public transportation, and public school capacity. In addition, I am against the use of eminent domain unless in the case of overriding public benefit resulting from that use*. I do, however, support the affordability ratio that has been proposed by Mr. Ratner and supported by a number of affordable housing advocacy groups as a very progressive model for affordable housing in the City of New York. In addition, I applaud Mr. Ratner's commitment to prevailing wages for both the construction trades workers and building service workers in this project. In response to the second part of your question, I see development as a particularly daunting challenge in the 33rd district. Over the past ten years, we have seen a tremendous amount of overdevelopment throughout the City, as well as in the 33rd district. Frequently, this overdevelopment has not been to the benefit of the surrounding community. All too often, luxury condominiums in Brooklyn have been marketed in Manhattan, while leaving longtime community residents out of the process. I have been very supportive of recent City Planning initiatives to implement contextual rezonings which limit height and density to the context of the surrounding neighborhoods. In particular, I have supported, and worked on, the recent proposed contextual rezoning of 175 blocks in Williamsburg and Greenpoint. In order to preserve the character of our neighborhoods, we need to have future rezonings that reflect the surrounding neighborhoods. In addition, I support Good Growth Standards for new development throughout the City, and I am in favor of writing a Good Growth Standard into City law. Larger developments should be required to address the consequences of their projects: the need for affordable housing, environmental and infrastructure impacts of the development, and the need for open space and park space, as well as community facilities. In addition, I am supportive of mandating that all large-scale market-rate development include at least 20% affordable units on site in their projects. Vito Lopez gets most of his campaign contributions from developers and, interestingly enough, chiropractors. . . . Now it becomes clear that Lopez has been bought by Bruce Ratner's family. Bruce Ratner, developer of the $4 billion Atlantic Yards Nets arena and mega-housing project in Brooklyn, is about to get another special, secret, sweetheart deal from our state politicians. Over the weekend, Vito Lopez, the powerful Brooklyn Democrat who heads the state Assembly's Housing Committee, quietly inserted wording tailored for the Ratner project into a new state property tax exemption bill. It's worth at least $100 million in real estate tax exemptions and possibly as much as $170 million for the market-rate condos Ratner plans to build on the site, one housing expert estimates. It also allows Atlantic Yards to charge hundreds of dollars more in rent per month for "affordable" units than any other other developer of similar housing. a) The Atlantic Yards proposal brought together some of the poorest concepts in urban planning with troubling public financing mechanisms. Situated in an area that calls for a sensitive treatment, the proposal relied on outdated urban design, over-taxation of existing infrastructures, would worsen an environmental hot spot, and use public financing and eminent domain for private enrichment. I believe the lack of public involvement, transparency, and accountability has been irresponsible. The public benefits Atlantic Yards claims to offer are almost certain to be illusory, and will undoubtedly be even more challenging to achieve in the current fiscal environment. I believe that the Atlantic Yards situation drives home the need for reform of Public Authorities and the exploration of more equitable ways to create affordable housing. I support development at the Atlantic Yards site that respects and integrates the surrounding neighborhoods; includes a transportation plan that works, affordable housing that meets the community’s needs and involves the public in a substantially meaningful way. To this end, I have been involved in almost every effort to bring about real change to what is happening there. 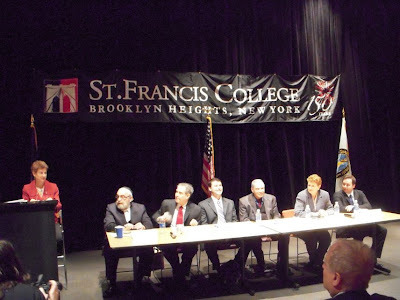 Among other things, I chaired the Boerum Hill Association’s task forces and was instrumental in the creation of the Council of Brooklyn Neighborhoods, the www.brooklynspeaks.net, the Brooklyn Speaks Governance Proposal, and A11395, a bill to create a governance plan for development at the Vanderbilt Yards. b) Previous Rezonings and approaches to waterfront issues have not gone far enough to achieve the promises made. This will be further complicated in the future by current fiscal woes. I support progressive, sustainable efforts, such as the Brooklyn Greenway Initiative. I signed the Pledge to Uphold Accountable Development because I believe it is important to achieve living wages, balance, transparency and accountability when it comes to development. 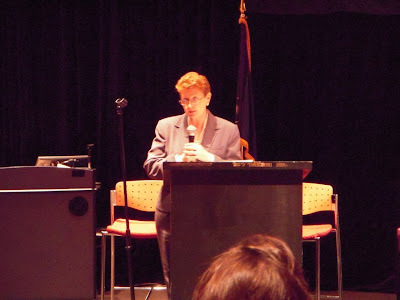 At the CBID candidates forum on the 23rd we asked Ms. Simon about her identification with the “mend-it-don’t-end-it ” Brooklyn Speaks philosophy of Atlantic Yards. We did so partly because of the Atlantic Yards Report coverage (Thursday, April 23, 2009, Looking at the 33rd district race, AY, and some undercurrents). We followed up with her again at a City Hall press conference (on the 28th) calling for the Dock Street project to be stopped where Pulitzer Prize and National Book Award winning, historian David McCullough spoke. (Other candidates for the 33rd council seat attending that event were: Ken Baer, Ken Diamondstone and Evan Thies.) Ms. Simon said she does not feel that “mend-it-don’t-end-it” is a fair characterization of the Brooklyn Speaks coalition position. We think it is probably pretty good shorthand. Jo Anne, on Atlantic Yards, you’ve been identified as part of the “mend-it-don’t-end-it” approach. Is that true? And if it is true, why not something stronger like taking the site away from Ratner, dividing it up and proceeding with something like the Pacific Plan or the UNITY plan? Actually, let me say that is an articulation of my position that isn’t mine. If you may recall, and you may not, but very early on, I was asked to chair the Boreum Hill response to Atlantic Yards and to do so in a way that was consistent with what the board wanted us to look at which was to investigate- (this was in the beginning we didn’t know very much at all really about it- We’d heard a lot of things) We did that. We actually led lots and lots of community forums where we educated the public about being involved and about what they needed to know with regard to traffic and transportation and how to respond to these positions. The Boreum Hill Association took a very strong position a few months later as a result of this investigation, ultimately declaring its very significant concerns with regard to the project and essentially opposing it. Now, my position is always to work with people. And I know that there are people that I work with on things like Friends of Douglas Green Park (one of the efforts I created) that are signatories of the Community Benefits agreement. I work with people all across the spectrum and I am very respectful of those positions. I was one of those people who really pushed hard to get the Council of Brooklyn Neighborhoods created because I believed that, in fact, we needed more people at the table than less. I sent an open letter to everybody involved on both sides of this issue in Brooklyn in early 2004 requesting a process where we could all get together to discuss these issues. There was nobody, actually, who wanted to do that, who wanted to get on board and talk with each other. I then was one of the people who helped create- Because there were a lot of people who were involved with CBN [Council of Brooklyn Neighborhoods], or who are still involved with CBN, who created the Brooklyn Speaks effort which was an effort to create space at the table for people to have those conversations. And, indeed those conversations are happening with people across the spectrum, most of whom frankly, do not like this project. I think there is very little, if anything, which is good about this project and I have been very clear about that. I think that my statement in the questionnaire is very clear. I think that this project suffers from many, many, many fatal flaws. And I don’t know what you mean by “stronger voice” but I have been a very strong voice criticizing this project and, unfortunately, for a variety of reasons, - he had a lot of problems- I spent a good deal of time. Allen can tell you, Fleischman, can tell you, talking to Eliot Spitzer about this and refuting his points one by one with regard to the Atlantic Yards project. So there is nobody that is a more clear voice on Atlantic Yards. Next, when it comes to Brooklyn Speaks, it is not clear they have gained a place at any table, and if they have, it is not clear how effective their presence is because their “ask” is so much less than it should be. We have written about what their “ask,” at a minimum, should be. They have not incorporated our suggestions. See: Effective Action Needed From Brooklyn Speaks, BHA, etc. Picked up and posted by No Land Grab, March 19, 2008, BrooklynSpeaks.net. This goes to the heart of the most important question when considering the position of politicians with respect to Atlantic Yards: What effective action will they take to stop it? At the earlier candidates forum on the 20th, candidate Ken Baer answered the question about what effective action he would take by saying he would go to court. That is not actually a good answer coming from someone running for City Council because the community has already gone to court to fight the project. Further, one does not have to be elected to the City Council to have the tool of going to court in one’s arsenal. The question is what can one do in positions of elected office such as the City Council to effectively stop the project. What can one do that one cannot do as a mere member of the community? Nevertheless, Mr. Baer’s reference to going to court points to a key split in the community: What constitutes effective action to stop the project? 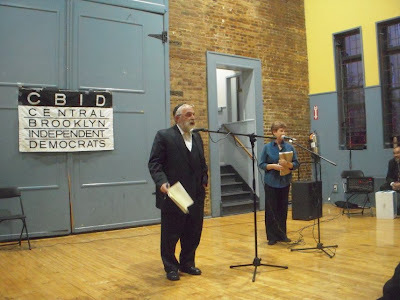 Brooklyn Speak’s efforts to gain a seat at the table or the litigation of Develop Develop Don’s Destroy’s coalition of groups with which Mr. Baer was involved? Clearly, without the litigation, Brooklyn Speaks’ efforts would have been bypassed as a fecklessly disregarded request. On the other hand, the time that has been bought by the litigation has allowed members of the Brooklyn Speaks coalition, particularly the Municipal Art Society, to create forums and opportunities for the public to grow better informed about the horridness of Atlantic Yards. Those forums have also provided an opportunity for the Develop Don’t Destroy groups to reach a wide audience. Without these mainstream forums there is doubt that there would be such unanimity among politicians as to Atlantic Yards being highly objectionable in so many ways. Among the effective things the Municipal Art Society has done in the interregnum created by the litigation is creation of the Atlantic Lots website and public information campaign. But while the Develop Don’t Destroy coalition and the Municipal Art Society have done much in this time to protest the project and inform the public, the efforts of other members of the Brooklyn Speaks coalition have been relatively lax and far less effective. In this regard, we cannot help noting the opportunity Ms. Simon herself missed to single out Atlantic Yards at the forum on the 20th when asked what was the worst boondoggle project in Brooklyn and what she would do to stop it. We have spent a lot of time on Ms. Simon’s position but we believe it is important because it points to an critical dividing line in identifying appropriate action and also because Ms. Simon is a frontrunner in the race. The other day when we introduced her as a frontrunner, Ms. Simon admonished us to say “the frontrunner.” Note that at the evening of the 23rd CBID endorsed Ms. Simon. (a) My personal position has always been to reject the project because of the flawed process that allowed it to move forward with very little government scrutiny, community input, or planning for the adverse impacts it would have on infrastructure, traffic, and the availability of resources. Other development there – that which would be more easily integrated into the surrounding communities – is much more ideal, as the site could be a boon to the local economy and a source of new and much needed investment in affordable housing. (b) Unfortunately, the current administration has employed a “ready, fire, aim” policy of development, with very little regard or planning for impacts on existing communities and citywide infrastructure. The City has also advanced rezonings that have largely favored luxury development instead of truly affordable development, and only provided housing for low- and middle-income residents when forced to do so. Every neighborhood in the 33rd District could be negatively impacted by such policies in the coming years, and it is especially important that we fight for mandatory and truly affordable housing and a community-based, comprehensive land use process in new rezoning initiatives such as the ones being considered in DUMBO and Boerum Hill. That is why I have advocated for what I call “360 degree planning”—a planning process that would force the City to honestly and totally assess the impact of significant new land use projects. I also support making affordable housing mandatory in projects of a certain size and improving the supervision of developments once they’re improved. To protect communities from bad construction, I have proposed creating “construction hot zones” that would concentrate DOB resources in heavily developing neighborhoods such as those in the 33rd District, and increase fines for bad construction in order to pay for more inspectors on the ground (please see attached memo on DOB reform and 360 degree planning proposals entitled “Evan Thies 2009 Responsible Development Agenda”). Mr. Thies used to work for Councilman Yassky. There has been speculation as to why Mr. Yassky has not endorsed Mr. Thies, or anyone else yet. 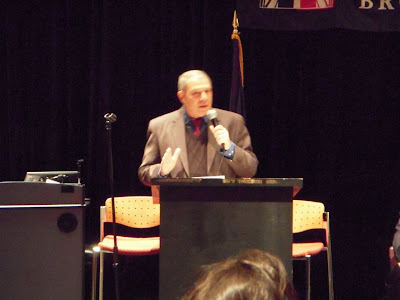 (The Brooklyn Paper’s “Politicrasher” pointed out that Mr. Yassky has not endorsed Mr. Thies without pointing out that Mr. Yassky hasn’t endorsed anyone yet.) Thinking has been offered that Assemblyman Lopez, a powerful politician, doesn’t want Yassky to endorse anyone other than Mr. Levin, his chief of staff. People are also wondering whether with the musical chairs resulting from the extension of term limits Mr. Yassky would forego the Comptroller’s race and run again for his old council seat. (Mr. Yassky himself voted for term limits extension, notwithstanding his admission in the chamber at the time of his vote that his constituents were overwhelmingly against it.) As noted, if the term limits extension permits Bloomberg a third term, the opponents of Atlantic Yards, Yassky included, will have a much more strenuous fight on their hands. We will return in minute to the question of Mr. Thies and possible effective action to stop Atlantic Yards. First, here for reference from the same CBID questionnaire is the postion of David Yassky, the current City Councilman for the 33rd. As noted, Mr. Yassky is currently running for the office of Comptroller. I have never supported the Atlantic Yards development as proposed by Forest City Ratner. I have fought to keep the building lower, and urged the City to put in place a traffic mitigation plan. In 2005, I saw the potential for good jobs and economic development but was concerned about the development’s potential effects on our community. I still believe today that there must be a traffic mitigation plan in place, and that the site as currently designed is too large. I believe that the State and City should not invest any further resources into this stalled project and that federal stimulus dollars should absolutely not be used on the project. As City Comptroller, I will make sure to keep a watchful eye on this project as it relates to City funds and contracts. "I don't think the project as put forward by Forest City Ratner and approved by the State is going to be built. There just isn't the funding for it. It doesn't work in this economy. It's really time to go back to basics and say 'what do we want at that site?' Now of course we want housing—we want affordable housing—we don't want it on the giant scale that was proposed but we do want housing, and affordable housing. Let's start with that now." "If they [Forest City Ratner] come in and say no we're not gonna do or we can't do these [MTA] transit improvements, they should lose every single right they have for that project." "It's time for the Paterson administration to take charge of this project. It's a state approved project, the state government is calling the shots, they at least have the authority to. It's time for them to really get engaged." Yassky also speaks out against the project in the newest (short) Atlantic Yards documentary that debuted yesterday: Brooklyn Boondoggle. “There is one plain truth here," . . . ."The community has never had its say in this project." We should also eliminate corporate welfare. . . .
Of course, the single biggest example of corporate welfare is the proposed Atlantic Yards development. The Bloomberg administration has agreed to give the project's developer at least $100 million in direct subsidies, plus another $400 million to $500 million in tax breaks. In the current financial climate, this handout is impossible to justify. We will conclude this Part II with the following. We noted in Part I that we thought that Evan Thies gave the best response to the question about Brooklyn’s biggest boondoggle and what he would do to stop it when he identified Atlantic Yards “because of the sheer size and cost of the project.” It also includes the arena and he noted he is opposed to the wasteful public financing of sports venues like that and the Mets and Yankee stadiums. He said that we should be getting the money back from projects like that to spend on things we really need like affordable housing. And he said another alternative project should be built at the Atlantic yards site that “creates affordable housing at a reasonable size.” Then, in his concluding remarks, Mr. Thies spoke about how the city wastes funds on projects like Atlantic Yards and how now is the time for leaders to come forward who can be effective in City Council. As we said, we’d like to think that means recapturing those Atlantic Yards moneys as Evan spoke of. To assist those formulating their suggestions in this regard, we offer the following as a reference on the mechanics of pulling the plug on the project: Friday, December 26, 2008, A New Year’s Revolution List (Starting 2009 Off Clean: Pull the Plug On Atlantic Yards).